A nationally recognized leader in urologic oncology, Robert G. Uzzo, MD, FACS, understands the value of sharing his knowledge with the next generation. This week, Dr. Uzzo received the prestigious 2014 American Urologic Association’s (AUA) Residents Committee Teaching Award at the organization’s 2014 Annual Meeting in Orlando, FL. Dr. Uzzo is the Chair of the Department of Surgery at Fox Chase Cancer Center, and holds the G. Willing “Wing” Pepper Chair in Cancer Research. 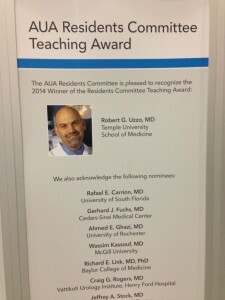 The AUA Residents Committee Teaching Award is presented annually to recognize an outstanding urology educator or program director who has dedicated a portion of his/her career to teaching residents. This award also serves to recognize an individual who influences residents to pursue a career in academic medicine. A fellow of the American College of Surgeons, Dr. Uzzo specializes in the treatment of kidney, prostate, testicular, and bladder cancers and procedures for urinary diversion. He is skilled in minimally invasive procedures, including pure laparoscopic and robotic surgery. He is also the national urology principle investigator for the Eastern Cooperative Oncology Group (ECOG) trial to evaluate targeted therapies for kidney cancer, and is the co-chair of the genitourinary early management committee at ECOG. Dr. Uzzo’s honors include the American Association of Cancer Research’s 1999 Yong Investigator Award. At the Cleveland Clinic Foundation, he was a fellow in urologic oncology and renal transplantation and renovascular surgery, as well as an American Foundation for Urologic Diseases scholar. He is an active member of the American Urologic Association, American Association for Cancer Research, Society for Basic Urologic Research and the Society of Urologic Oncology. Dr. Uzzo has lectured extensively nationally and internationally on topics in urologic oncology and has published more than 200 chapters, manuscripts, and abstracts on various aspects of genitourinary malignances. Dr. Uzzo is certified by the American Board of Urology. He received his MD from Cornell University Medical School and completed residencies at New York Hospital-Cornell University Medical Center and Memorial Sloan-Kettering Cancer Center.